Pick up from Your Hotel at 8 AM Morning and leave for the Masterpiece carved out in Heaven-CliffTop Club,Auli (Worlds Second Highest Resort,290 Km).Enjoy the landscapes and scenery on the way.Route to Auli is in parallel tune most of the times with the Rivers like Ganga,Bhagirati,Alaknanda,Mandakini,Pindar,.etc.Reach Joshimath by 4 PM.Enjoy the Asia’s highest and longest Ropeway connecting Joshimath-Auli 4Km/22 minutes.Enjoy Sunset on Nanda Devi (Worlds 4th highest peak) & other snow clad ranges over a cup of Tea from Your Room or Deck.Enjoy Bonfire Music with Dinner,Night stay at Resort. After the Breakfast Leave for the local guided treks to have a beautiful view of Helang Valley. 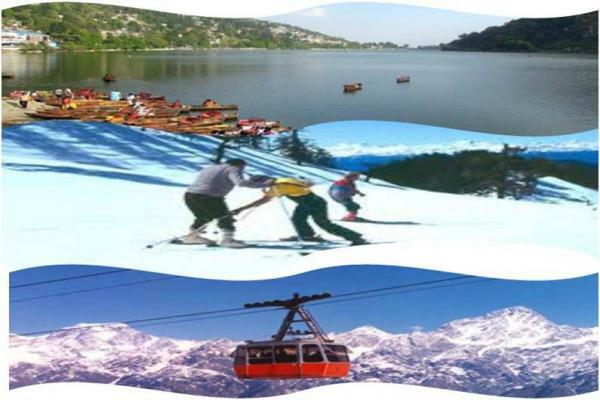 Enjoy open Chairlift ride to sanjeevni temple.After Lunch,visit Lake Valentine amidst thick pine forest and..Enjoy Sunset from Gorson Sunset Point..Enjoy Bonfire Music with Dinner,Night stay at Resort. After the Breakfast Leave for your journey back to Your Pick-Up Point for your further journey.